“Fiber Optics” is a comprehensive group exhibition of 42 emerging artists that exemplify fresh, innovative approaches to “fiber art.” The artists selected have reinvented traditional craft processes such as embroidery, crochet, knitting, weaving, sewing, and quilting. Rather than follow prescribed methods, they merge traditional craft with sculpture, installation, and video art; and utilize unexpected materials that transcend their banal origins with integral symbolism. Though the approaches are unconventional, technique, precision, and aesthetic appeal are still at the core of their processes. ”Kevin Curry’s substantial architectural installation (15’Wide x 10’Deep x 13’High) entitled ‘Housewarming,’ acts as a protective shelter that a viewer can walk inside of for respite. 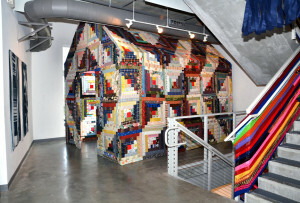 Kevin draws a connection between the warm feelings, familial connection, and sensation of “safety” a quilt can offer”. This has been an ongoing work of mine, that I recently completed after years of sewing (and resewing) – displaying it in my new home-state of Florida has great significance surrounding it’s representation the shelter I had been seeking for so long – a place of respite and contemplation.